Slightly tweaked from Kathy’s recipe. Stir in eggs, one at a time, until thoroughly combined. Bake at 400° for about 30 minutes or until golden brown. 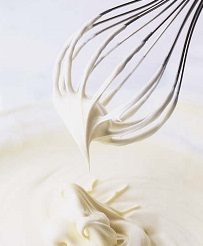 In a bowl, beat together the cream cheese with a little milk, until smooth. Add vanilla instant pudding mix and the rest of the milk. 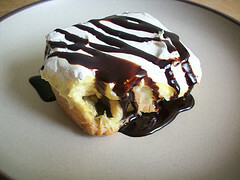 Top the pudding mixture with the whipped cream and drizzle with chocolate syrup just before serving. Both are good, but the melted Ghirardelli Milk Chocolate is our favorite! I will post a picture of the melted chocolate version next time I make it! This is such a great dessert! I made it one year for Easter and everyone loved it; nice and light after a big meal. Unfortunately, I had lost the recipe so you can imagine how thrilled I was to find it again here! I defiantly would recommend trying it out. Thank you for commenting! It’s a family favorite of ours too. Enjoy, Merry Christmas!